Hello! Excuse the Big Pink Link imposter. Lucy from This Mum’s Life is not feeling too well so she has asked me to fill in for her over the next couple of weeks. Thats right! You have my ugly mug for two whole weeks. Sorry about that. I am over the moon to have been asked to help so of course I jumped at the chance. It was lovely to be thought of and trusted. I hope I don’t balls it up! A linky is a great way of bloggers showcasing their posts and to share the love with other bloggers. There are a few little rules to follow which are listed below. If you have any questions do not hesitate to ask any of us. We are a lovely bunch. 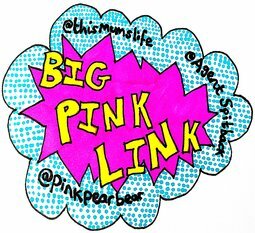 The Big Pink Link is one of my favourite linkys (and always has been) because of the kind community it has built up. As I sit here writing this I have an empty house! I know… A flippin’ empty house! The Husband (who will currently be referred to as the best husband in the world) has taken the girls out for a couple of hours. Don’t worry I am sure he will soon loose that title when he leaves a trail of rubbish in his wake. So on to the link up. The first Wow from Hannah is by Something Strange with Looking After Ourselves: Art of Self Care, not only does she talk about how important self care is but she also passes on some fantastic ideas on how to achieve self care. Hannah’s second Wow from last week had to be this from Petite Words – I’ve Written a Children’s Book, who has not only written a children’s book which looks beyond adorable but is also giving all the profits to charity. Louise’s first wow is by little old me! (You ladies are filling me with happiness this week!) 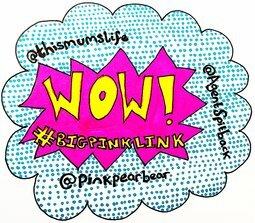 This is what Lou had to say: My first Wow happens to come from our special guest host this week! I absolutely loved these simple tips to live a more positive life from Kirsty. It’s great to have a check list when life gets overwhelming sometimes. Find it HERE. Louise’s second wow is from Four Princesses and the Cheese: The Brighter Side of Bad Me. It was spot on and so funny too. I love that she has resigned herself to not being Pinterest perfect and as a result is nailing parenthood!